MOTOR OPTIONS F115 | F150 | VF150 F175 | F200 KICKER MOTOR OPTION T9.9 Optional Minn Kota® trolling motors available, including the 24 V, i-Pilot® Series Plush high back swivel seats provide all day comfort while on the water. 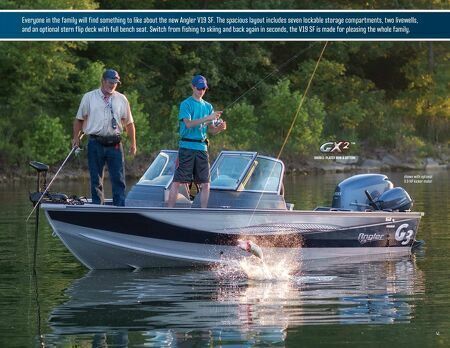 Movable to any one of six seat bases in the boat Convenient rod storage system organizes and protects rods up to 8' in length GX2 double-plated bow and bottom, increases the durability and performance of the Angler V19 SF An open layout with an extra large cockpit space provides more comfort for a group of family or friends Extra large 35 gallon livewell with baitwell Bow livewell has 15 gallon capacity. Along with the stern 35 gallon livewell, you have more space for your catch than many high-end bass boats 40 g3boats.com Custom tilt wheel compliments the command center. Quality Faria® gauges include tach, trim, speedo, fuel & volt Lockable center storage with mounted rod holders & tip protecting tubes. Manages rods up to 8' in length and has room for extra gear. Newly redesigned console features custom tilt wheel, hydraulic steering, "soft-touch" vinyl, toggle switches w/ LED indicator and quality Faria® gauges. 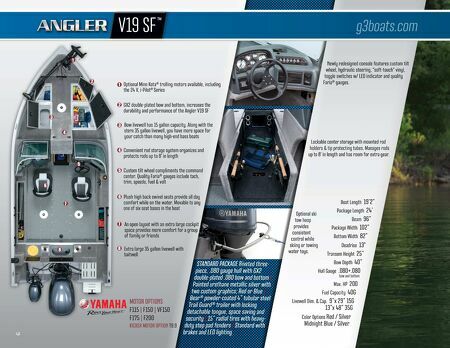 Boat Length 19'2" Package Length 24' Beam 96" Package Width 102" Bottom Widt h 82" Deadrise 13° Transom Height 25" Bow Depth 40" Hull Gauge .080+.080 bow and bottom Max. HP 200 Fuel Capacity 40G Livewell Dim. & Cap. 9"x 29" 15G 13"x 48" 35G Color Options Red / Silver Midnight Blue / Silver STANDARD PACKAGE Riveted three- piece, .080 gauge hull with GX2 double-plated .080 bow and bottom | Painted urethane metallic silver with two custom graphics; Red or Blue | Bear® powder-coated 4" tubular steel Trail Guard® trailer with locking detachable tongue, space saving and security | 15" radial tires with heavy- duty step pad fenders | Standard with brakes and LED lighting 1 1 2 2 3 3 4 4 5 5 6 6 7 7 8 8 Optional ski tow hoop provides consistent control while skiing or towing water toys.